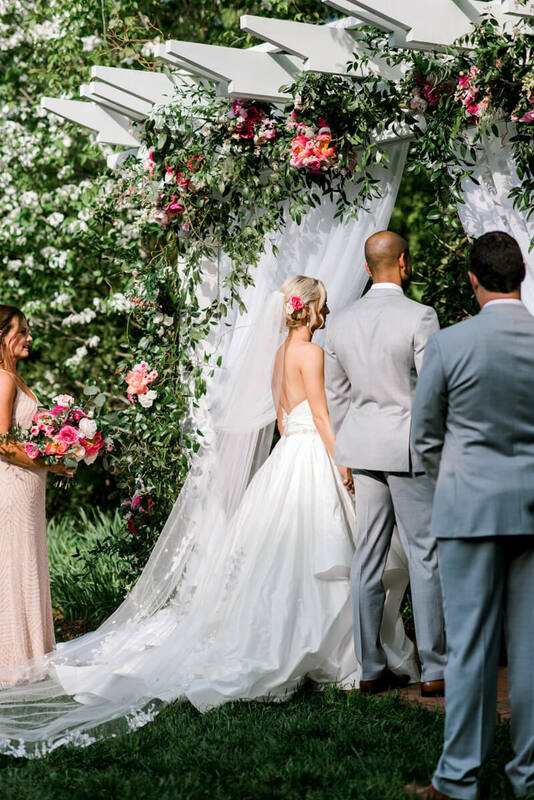 Beautiful countryside garden NC wedding at the Fearrington Gardens. Roy and I met through his best friend (and best man) Jay. Jay and Roy grew up together in Switzerland. Roy then went to Ithaca college in NY and and Jay went to NC State (GO PACK!). I was actually friends with Jay first, since we both lived on the 5th floor at University Towers our freshman year at NC State. Jay then introduced me to Roy when Roy moved to Raleigh in 2010. We were celebrating our 2nd anniversary at the Fearrington. Roy told me he had a gift for me but that I could open it until after we had “high tea” (which they have there daily at 4pm). He didn’t eat much at tea time, so I knew something up (he normally eats EVERYTHING). So, after tea we walked out, hand in hand, to see the cows by the white picket fence. His hands were SO SWEATY. I was like, man he is really nervous about something! I opened his gift by the fence as instructed. At first, I thought it was going to be something related to the cows (because I love them!). But it was even better. The gift was a picture book, telling the story of “us” and our relationship. On the last page it said “Chapter 2” and had a picture of the engagement ring. He then got down on his knee and held up the real ring. (I think I blacked out at that point). I was in total shock! I had no idea he was going to propose then. I, of course, said YES! Meanwhile, he had one of my girlfriends sitting in disguise on the chairs near by, taking pictures of the entire thing! It was literally perfect! 3. When did you know he/she was "the one?" My vision was “rustic chic”. 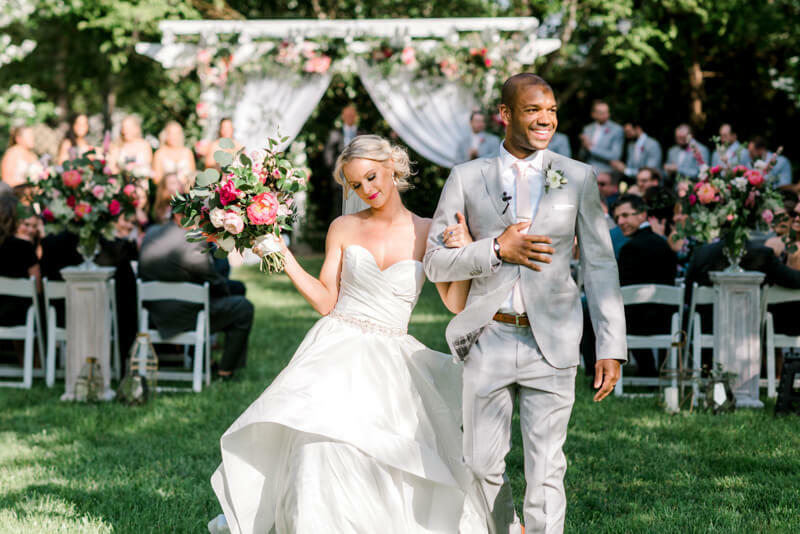 I spent 14 months looking, pinning, stalking, liking and following ALL THINGS WEDDING. I did it every night. It helped me figure out what I liked and what I didn’t like. I wanted a chic, contemporary vibe with lush, beautiful flowers in a rustic farm setting. I wanted our guests to feel like they were in a romantic, spring garden surrounded by flowy drapes, twinkle lights and glamorous decor. The Fearrington florist and wedding coordinator nailed it. I might be a little biased here, but I think we had the best bridal party of any wedding I’ve ever been to. We couldn’t have asked for better (or more fun) friends to share this incredible day with. Funny story: Make sure to check your dress for a bustle BEFORE your wedding day. Gilda, my wedding coordinator, went to bustle my dress minutes before the reception and found, to her surprise, THAT THERE WASN’T ONE. AT ALL. (Let me remind you, I wore a huge ballgown dress). My jaw hit the floor. I then had 4 frantic women under my dress searching and searching for a bustle, but there was nothing to be found! Not to worry. I had the world’s best wedding coordinator. Gilda unzipped her fanny pack, whipped out a long piece of yarn, and a safety pin the size of a cucumber. She assembled a makeshift bustle in 2 minutes flat. No one could even tell. Crisis averted. We may have been 30 minutes late to our own wedding, but Gilda made sure that I had that bustle! At the end of the day, no matter what my dress looked like, I married the love of my life and had THE best dance party with all 200 of my closest friends and family. Best. Night. Ever.